A chaplain is typically a pastor, priest, or other member of the clergy who serves a group of people who are unable to attend religious services for various reasons. In many cases, these chaplains often join the military to help the enlisted practice their faith while serving their country. Often shipped out with the military for combat overseas or deployed at local bases, these chaplains lead interesting lives. No longer something to read about in interest pieces in the paper, chaplains also take advantage of the ever-growing blogosphere to discuss their work, daily life, and much more. For the best of the blogs, we have collected the top 25 chaplain bloggers, including their wife bloggers, and a few specialty choices. 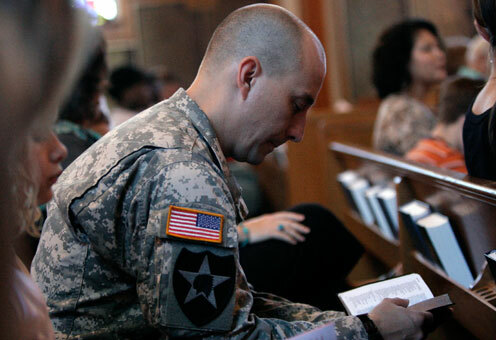 These chaplains serve both God and country and write all about it in their blogs. 2. 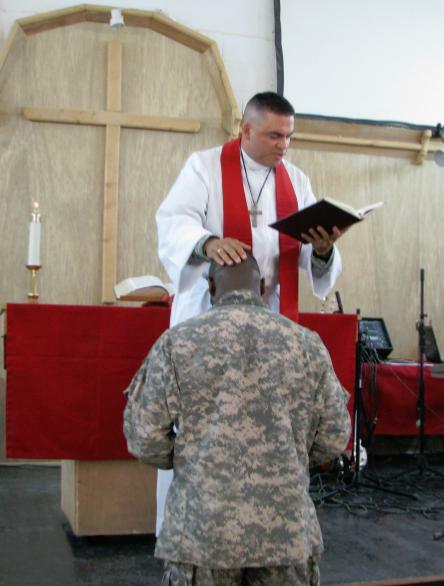 Army Chaplaincy : This blog provides news and information about the ministry of chaplains in the United States Army, Army Reserve, and Army National Guard. The goals are to inform readers about chaplains, share knowledge and experiences, assist in recruiting, and support the religious freedoms of soldiers. Categories on the blog include news, ethics, and even a special section on what chaplains do. 3. Chaplain Andrews : Chaplain Keith J. Andrews assumed his current duties as the 266th Quartermaster Battalion Chaplain, Fort Lee, Virginia in December 2009. In 2004, he was endorsed as a Chaplain by the Southern Baptist Convention and appointed as an U.S. Army Chaplain. He is also married and has four children. In addition to his blog, he also has presentations he has done available with a click. 4. Covenant & Code : Mark has been blessed with the opportunity to support the troops in Afghanistan in their faith while deployed with the 110th Chaplain Detachment. Over the next 400 days, he plans to use the blog to document what he is doing. Follow along as he visits new countries, learn new languages and customs, and conducts his duties. 5. Life’s Narrow Path : Michael entered the Army as a Chaplain in June of 2008 and was deployed to Iraq in support of Operation Iraqi Freedom in 2009. Now back at Fort Hood, he and his wife are searching for a house. Read about current life or entries dating all the way back to 2007. 6. Chaplain Darren : He has traveled to Afghanistan and back. Along with Mama of Many, they blog on what life has been like both overseas and home. Many moving pictures are also included. 7. Chaplain Dave : He is a 31 year old Christian, husband, father, and army chaplain. His fourth child, Joy, was just born and he writes about her as only a father could. Dave has also begun Clinical Pastoral Education classes and tells more. 8. Chaplain Jim : Jim Mitchem is a brand new army chaplain. He was selected for active duty and reported to Army Chaplain School (CHBOLC) on Jan 10, 2010 after serving as an enlisted soldier. A while can go in between blog posts but they are worth a look for optimism and an inside look. 9. Training for Eternity : Chaplain Brad Lewis began this blog in 2003 before leaving for a mission in Korea. What started out as a blog to chronicle his experiences there became a six year journey for both he and his readers. Read the entire adventure via blog by visiting. The chaplain’s wives also blog about life in the military. 10. Military Chaplain’s Wife : Laura’s best friend and husband is a chaplain in the army. With four children, one of which is also in the military, she mirrors the experiences of many true army wives and mothers. The blog is her journal of experiences of life, love, and family. They recently finished a family vacation and she posts loads of pictures. 11. Breakthrough : Nicole is a military mother who travels with her family. Recently stationed in Korea, her blog is full of details about her new life. There are also many useful links for military wives. 12. Small Steps of Faith : This blogger is the wife of Chaplain Dave. She is also mother of four and just had a baby. Blog life tells all about family life and her husband’s CPE course. 13. Army Chaplain’s Wife : Lauren and her chaplain husband reside near Fort Carson. They are both expecting a baby and write all about it in the blog. It also includes prayer, wishes, and daily life. 14. Army Wife Network : Whether you are a wife in the military or have a husband who is serving, this network is for all army wives. Click on Blogs to begin reading. You can also get podcasts, webinars, and much more. Be sure not to miss the Message Boards with loads of support. 15. Wives of Faith : If you are the wife of a chaplain or have a family member in the military, this site is for you. You can visit to read the blogs of other wives who connect, support, and encourage the military. Visitors can also start their own or get information on local groups and programs. There is even an online book club. These blogs cover a unique area of the chaplain. 16. Curmudgeon: An Unlikely Army Chaplain : Think you’re too old to join the army? So did this blogger, but he did it anyway in his 50’s. He is also a Catholic priest, molecular neurobiologist, scuba diver, and more. Father Tim has since returned to civilian life but blogs about both his experiences as a chaplain and a citizen. 17. Chaplaincy Matters : Tim Barrett is the Chaplain at Northern Beaches Christian School and associate of the Sydney Centre for Innovation in Learning. He is also passionate about connecting students with God and teaching effectively using technology. Get everything from tech tips to benedictions on one blog. 18. Adventures of a New Army Chaplain : Steve Bareis is from Du Quoin, Illinois. Follow his blog as he enters and graduates chaplain school. Although he finished over a year ago, his blog is still full of what chaplains experience during their education. 19. Editor’s Blog : This blog is sponsored by the site MilSpouse.com. Its goal is to support the married couples who are serving in the military in any capacity. The blog contains the latest news items relating to military families. You can also visit the main site to get tips on relationships, deployment, family, money, and much more. 20. Military Ministry : Visit here for the site of an organization that helps military members become chaplains. It also helps churches welcome back returning soldiers, veterans, and families. Be sure to check out the Standard Bearer for more resources. 21. Right Side Up : Chris Melvin is currently finishing studies at Phoenix Seminary. He has also pastored for a handful of years and is currently a National Guard Chaplain with the 1/158th INF BN. His blog is a place to collect thoughts on the “way things ought to be.” Daily life and political musings are often the topic of blog posts. 22. The Reformed Chaplain : John Craven invites you to follow him for 365 days as “unplugged, casual, and with no spell check.” He was first stationed in Germany before begin deployed to Fort Hood. He is currently on day 88 and has just begun his adventures. 23. Chaplain Candidate Jeff : Follow the story of a chaplain candidate in this blog. Jeff is married with three children and has reported to Fort Jackson for CHBOLC. He recently shared a video of a drill and ceremony competition he participated in. 24. Excellent or Praiseworthy : This blog is a devotional to help military families stay connected during deployment. The 40 Days of Deployment Dare is a popular choice and has tips for what to do each day. Al and Linda also give meaningful tips for what to do in between. 25. Christ and Combat Boots : TC Houston is an army chaplain and first lieutenant serving in the Army National Guard. He recently completed a full-time tour at Fort Carson and is currently serving with the Honor Guard while preparing for deployment. His latest entry was on a summary of army chaplaincy and is a good read for what to expect during time as a chaplain. Whether a member of the military, have a family member who is, or are an ordained chaplain yourself, there are loads of stories for inspiration, faith, humor, and much more on the above top 25 chaplain blogs.